“We’re hoping to get on the water next week,” Caroline Kaye ’18 said in an interview with the Justice. Imagine the notion that not all philosophers have beards! This seems simple, right? Philosophy would disagree. Midterm season is officially here. There are tests to be taken and papers to be written. There’s less pep in our steps, and the library is a bit more crowded than usual. It’s 5:30 p.m. on a Monday or Thursday, and most students are predictably heading to Sherman or Usdan, hoping to beat the rush. “I have never learned Spanish in my entire life, and Peru is a Spanish-speaking country,” Candice Jiang ’19 said in an interview with the Justice. Spanish is one of the many things that Jiang, a biology and anthropology major from China, learned while on the service trip to Peru that she embarked on over the most recent break. What's so bad about LSD? “Those who consume their medicines rarely understand the risks that were taken to create them. In a society that has made their work a crime, the psychedelic chemist is an outlaw.” The smooth, focused narrating voice of Hamilton Morris carried through the crowded auditorium at the International Business School. As Brandeis University students well know, Louis D. Brandeis’ career achievements were groundbreaking and revolutionary — but many may be unaware of the achievements of Alice Goldmark Brandeis, Louis Brandeis’ wife. It all started with a photograph. Kathy Kleiman noticed an image of women surrounding the Electronic Numerical Integrator And Computer, one of the first ever electronic computers. What is progressive television? Are we really making progress? And how can the trend toward inclusive entertainment be continued and solidified. Three alumnae discussed how you can fight for women’s rights and against climate change through investing. “Take a day or a week and just look at what you buy. For many students, college is a time to explore new subjects while rediscovering old passions. It’s a time to find yourself. Though he was called “Red” in affectionate homage to his flaming hair, Mindy Fried’s ’89 M.A. “I’m a big fan of mashups and remix culture,” David Pepose ’05 said in an interview with the Justice. Aging is a topic of growing importance. In current society, ageism is rarely discussed in relation to prejudice. Author of “Making Sense: A Guide to Sensory Issues” Rachel Schneider ’05 recalled her first memory on the Brandeis campus with the Justice. 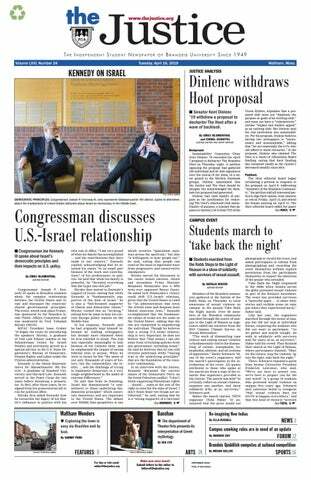 “I remember the first day I stepped foot on [the Brandeis] campus with my parents for a tour. Dan Hirshon ’04 grew up in Wonderland. An entire portion of his childhood home was filled with collectables of all kinds from Lewis Carroll’s classic novel “Alice’s Adventures in Wonderland.” This very specific decor was the result of his father’s obsession with all things Alice. Becky Winkler ’07 did not expect to publish a cookbook when she graduated from Brandeis with a bachelor degree in Psychology and Latin American Studies. Graffiti Room Tucked away on the fourth floor of Tower A of Usen Castle, a small room bursts with color. It’s the end of a royal era. At the end of this semester, Usen Castle will officially be closed as a residence hall for undergraduate students.